Jorge Alfonso Rojas Ornelas was a General Authority of The Church of Jesus Christ of Latter-day Saints. 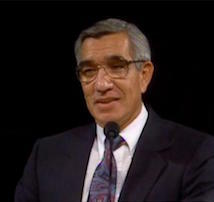 He served in the Second Quorum of the Seventy from April 6, 1991, to October 5, 1996. Rojas was born on September 27, 1940, in Delicias, Chihuahua, Mexico, and raised in Chihuahua City. Desiring to learn English, he attended the Church-owned Academia Juarez in Colonia Juarez. He boarded with an LDS family that encouraged him to attend English-language LDS Church meetings. He was baptized a member in 1959. He earned degrees in education and physical education from the University of Chihuahua and studied at New Mexico State University. He worked for the Church Educational System and later set up a business with his wife, Marcella, translating technical manuals from English for American companies with plants in Mexico. Rojas also served in the Church as a branch president, high councilor, stake president (twice), regional representative (twice), and presided over the Mexico Guadalajara Mission. He was called as an Area Seventy in 2004 and was president of the Guayaquil Ecuador Temple from 2008 to 2011. He and his wife are the parents of five children. This page was last edited on 22 March 2017, at 21:32.